As we have seen, earthquakes are caused by the reshaping of Earth through the movement of Earth's tectonic plates. 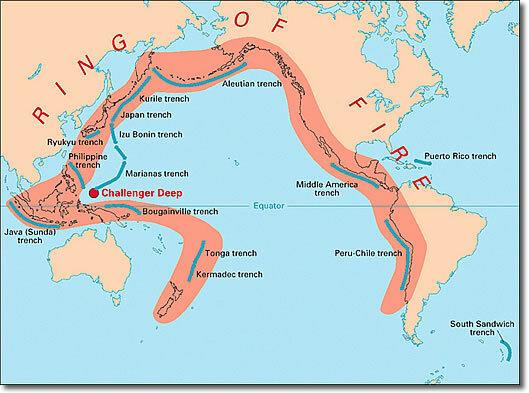 Most earthquakes occur along tectonic plate boundaries, along cracks in the lithosphere called faults, or along the mid-oceanic ridges but the majority of the seismic energy released in the world is from earthquakes occurring along the plate boundaries, particularly around the Pacific Rim or the so-called Ring of Fire where there is a particularly intense tectonic activity that causes Tsunamis on a regular basis. Image: The "Ring of Fire"
Frequent earthquakes along the west coast of Chile and North America, Japan and Alaska is caused by this activity. This is also the cause of volcanic eruptions in the Andes mountains, the Philippines and northwest United States. The "Ring of Fire" accounts for about 90% of the world's earthquakes. The next most seismic region (5-6% of earthquakes) is the Alpide belt which slices through Europe and Asia (it extends from the Mediterranean region eastwards through Turkey, Iran, and northern India). Incremental plate movement is responsible for the most powerful earthquakes on Earth. The South American subduction zone created the largest known earthquake in 1960 which registered M9.5 off the coast of Chile. Scientists have found that the deepest earthquakes in the world occur in subduction zones at depths of about 450 miles (600-700 km). High temperatures at these depths make it hard to understand the mechanism by which earthquakes are generated. The rock is too warm and soft to cause earthquakes below this depth. Earthquakes often occur in sequences. The main shock is the largest and principal event in a sequence. This is preceded by the foreshocks and followed by aftershocks, which can last for up to ten years after the event. Caused by release of residual stress, in areas not ruptured in the main shock, aftershocks may not occur on the same fault as the main shock.